This page collects my notes as I learn about my Nokia N800. It has been a wonderfully functional and hackable device. and add a link to it in the default runlevel 2 "ln -s /etc/init.d/rc.local /etc/rc2.d/S99local"
For extended use of the device, it is convenient to SSH into the device. However, it doesn't usually have a static IP address and looking up the IP address and manually typing it in is annoying so I set up SSH reverse tunneling. This also would allow access to the N800 if it were behind a firewall. First I generate a specific SSH key on the N800 using 'ssh-keygen -f ~/.ssh/sshforward -t rsa' with no passphrase. Note I create this key for this one specific purpose and use different keys that do have. passphrases to login to other places. I have access to the server middleman.com that has a static IP address and I create an account sshforward that has shell /bin/false and no password set. In the home directory for sshforward, create .ssh/authorized_keys with the line 'no-pty,no-agent-forwarding ssh-rsa xxxxKEY_HERExxx user@n800'. This should only allow the user sshforward to login via the one key and even with the key, the user should never be able to get a shell. In /etc/ssh/sshd_config, set the option "GatewayPorts yes" (and restart sshd) to allow remote hosts to connect to the forwarded port. 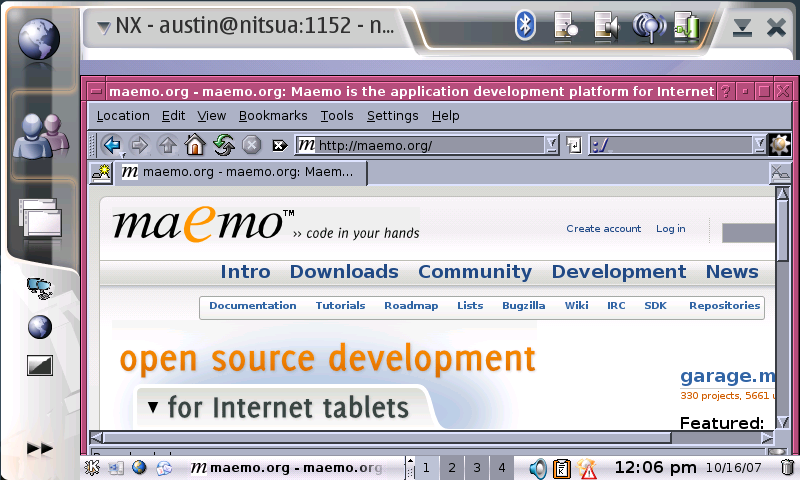 On the N800, I execute via a shortcut ssh -i /home/user/.ssh/sshforward -N -R 1234:localhost:22 sshforward@middleman.com. This forwards the port 1234 on middleman.com to the ssh port on the N800. so that I can just type ssh n800 and it works. Run "xmodmap xmodmap.dvorak" to change the keyboard layout. This only works with the hardware keyboard and won't change the on-screen software keyboard. Many useful tools are available. For running bora applications under chinook, this script downloads the necessary libraries. Change the repeat rate for a keyboard: create udev rule 'KERNEL=="event[0-9]*", SUBSYSTEMS=="bluetooth", RUN+="/usr/sbin/chroot /mnt/initfs evrepeat /dev/input/%k 5000 100"' and add "mount --bind /dev /mnt/initfs/dev" to startup script. Disable video chat from loading on camera coming out "gconftool-2 --set --type bool '/system/osso/af/launch-on-camera' 'false'"
To allow for listening in on the system dbus via dbus-monitor, create /etc/dbus-1/system-local.conf with the following. Note that using policy context="default" appears to do strange things as if something listening on the system bus may not be expecting a message that it receives. So I picked a user that isn't used at all and then run 'sudo su bin -- -c "dbus-monitor --system"'. This is just random notes for myself of what I do upon reflashing. For some reason, it seems that rebooting isn't always a complete reboot. Sometimes I can't reboot successfully without removing the battery, so some state is being saved. Screenshots. And it now works fullscreen! To debug the program if it fails, try running dbus-monitor to look on dbus for error messages. Also, make sure that you don't try setting the client to use fullscreen resolution as it doesn't work properly yet (above screenshot was made fullscreen in a different way). 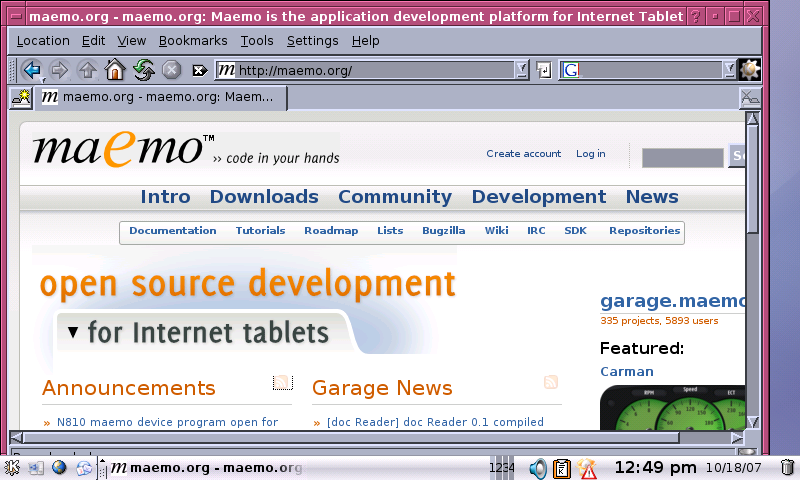 All files needed for running mpd on the N800 have been uploaded to garage.maemo.org. I wrote powerlaunch, a replacement for the Nokia closed source systemui and much more customizable. Arbitrary hardware key shortcuts can be defined, starting with the power key. Download from the project page.